Mutual threats of nuclear attack by Kim Jong Un and Donald Trump, Hawaiians fleeing the false alarm of an incoming missile, the U.S. and Russia unveiling controversial new nuclear policies and accusing each other of violating a crucial nuclear agreement in the midst of an icy winter for arms control. Not since the eve of the invasion of Iraq has media been paying this much attention to nuclear weapons. 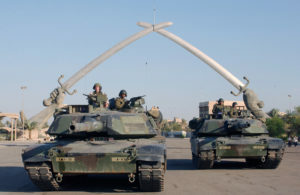 On the 15th anniversary of the Iraq war (March 20) it is timely to ask if journalism, still atoning for its complicity in selling false claims about weapons of mass destruction before that war, is better prepared to cover the nuclear story today. Among the fault lines running through the Iraq journalism debacle – an indictment for access journalism – was lack of skepticism and groupthink. Unfamiliarity with nuclear and other weapons of mass destruction technologies helped conflate the spectre of mushroom clouds and gas attacks with terrorism. Journalism was taken hostage by a riptide of false evidence and it swept most reporters covering the story off their feet. News media unwittingly brought Saddam Hussein’s non-existent weapons of mass destruction to life. (Disclosure I was working as a press officer in the IAEA at the time). In the current climate journalism could best serve the public interest by making more accessible knowledge about nuclear policy encouraging debate beyond the politicians, generals and defense industry bosses who conduct it. It’s a tough call. Nuclear resides in a secure dark room whose doors are bolted. The huge costs it incurs and risks it poses are afforded the secrecy of the national security state with little accountability and democracy. In North America the media landscape is cratered, there are fewer journalists digging for information and fewer outlets to offer a diversity of views. Giving the subject more journalistic attention requires investment and an altered mind set. Since the end of the cold war the norm has been to relegate nuclear to the inside pages. No one has died from a nuclear weapon since 1945 and the blue skies after the Berlin Wall came down in 1989 appeared unclouded by nuclear threats. The world’s nuclear arsenals have been reduced to an estimated 14,550 weapons from a peak of 70,300 in 1986. But the slogan on the seventies button, ‘one nuclear bomb can ruin your whole day,’ can no longer be as comfortably assigned to the irrelevance of memorabilia. A current quip is that it’s back to the eighties and suggestion that anxiety is mounting is borne out by one of the world’s major retailers offering doomsday food kits. The reasons for the new round of nuclear fear are manifold. Threats to post-cold war stability range from the extensive modernisation programs of nuclear weapons holders to emerging technologies such as autonomous and hypersonic weapon systems. Although a multipolar order has replaced the cold war’s bipolar relations its former adversaries are in sparring mode – the U.S. and Russia playing hard and fast with the facts and a revived cold war is well underway. Absent from current tensions are any meaningful arms control initiatives and the unravelling of previous nuclear non-proliferation achievements. There is a strong element of absurdity to nuclear policy. Why are taxpayers forking out for a doomsday technology whose use – based on the premise of mutually assured destruction MAD – would either incinerate them or have them stumble through a post holocaust nightmare. In the U.S. the public is on the hook for an estimated $1.7 trillion over the next 30 years to modernise America’s nuclear arsenal. The bill for Russia’s nuclear ambitions and China’s modernisation program are not as readily available. However, it’s safe to assume beneficiaries of the largesse will be the military industrial complex of each country. Three days before his retirement in 1961 U.S. President Dwight Eisenhower delivered a public warning of the ”unwarranted influence“ of the alliance between defense and commerce. Any response would be strengthened by fact based reporting, neither partisan nor hysterical, an accounting of costs and benefits based on a dialogue of respect between journalists and their audiences analysing countervailing forces in the current debate. With a new cold war it’s worth examining events that have contributed to current tensions and putting their history into context. Since Iraq journalists have obtained more tools to cover the nuclear story and verify false claims. The advent of big data, not without its downside, offers journalism analytical means. Crowd sourcing is also serving veracity. In spite of its secrecy there is a rich lode of data for journalists to mine 73 years after the explosion of the first nuclear device. The public has the right to become better informed about the bill it’s paying for supporting nuclear policy and journalism is an indispensable part of the picture. But does public opinion count? Edward Teller, so-called father of the hydrogen bomb, a model for the eponymous mad scientist in Stanley Kubrick’s Dr. Strangelove and a hawkish figure in America’s nuclear history had his own view. Robert Del Tredici, the author of the 1987 book ‘At Work in the Fields of the Bomb,’ asked Teller in a 1984 interview if weapons development in America is a democratic process? Left unsaid was how such opinion is formed. In the current howling gales of disinformation, and manipulation of data, thorough, trusted and fact based journalism becomes an even more important storm anchor to opinion about how we comprehend nuclear weapons.